On the weekend, my grandparents took my family and me to the movie, Muppets Most Wanted. We were really looking forward to it because we love the Muppets, and we had enjoyed the 2011 movie called The Muppets. Also, we had watched the trailer for the new movie many times and we thought it looked good. But I thought this movie was terrible and I was disappointed. The first thing I didn’t like about Muppets Most Wanted is that it wasn’t true to my idea the Muppets. When I think of the Muppets, I think of comedy that’s a little bit ridiculous and slightly bizarre, loveable little characters, storylines where everything goes wrong but in the end everything’s fine. This movie was not like that; it wasn’t very funny to me, even though it was a bit bizarre and ridiculous at times. Also it was too dark for kids; the bad guys were real master criminals, the movie was set in a nasty Siberian prison and there were too many guns and things blowing up. Another thing I didn’t like about this movie was that it was not believable. For example, I thought that the Muppets took too long to pick up on the fact that Kermit had been replaced by the evil, master-criminal frog, Constantine. The true Muppets would never take that long because they know Kermit so well and Constantine was so different from him. The last thing I didn’t like about this movie was that the bad guys were too mean and nasty. In other Muppet movies all the bad guys have a change of heart, but in this movie they don’t, and for that matter they don’t change at all. There wasn’t even anything funny about them. As you can see, I did not like this movie, and I strongly suggest not going. In the summer of 2012, I first read the Lord of the Rings trilogy. My dad had read me the Hobbit before and had tried to get me into the Lord of the Rings because he liked the trilogy. I wasn’t interested at the time, but now they’re my favourite books. I have always liked mythical adventure stories with dragons, wizards and other mythical beings. For example, I like the Harry Potter books and Greek mythology stories. The Lord of the Rings is the best mythical adventure series I’ve read. Even though I know this story is fictional, it’s so well written that I think of it as real. Tolkien created the Lord of the Rings as a mythology for England, but the stories seem like a real history. I like medieval Europe and have a fascination for swords, bows, arrows, spears, etc. Though the Lord of the Rings is not medieval, it includes the medieval things listed above. After watching The Fellowship of the Ring movie for the first time, I developed a fascination with Aragorn’s sword called Narsil. Narsil is the coolest medieval-looking sword I’ve ever seen because it’s the only one with a hollow pommel. 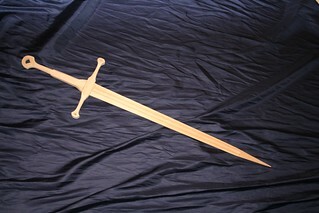 This Lord of the Rings sword fascinated me so much that my dad and I built a wooden replica. Another reason why the Lord of the Rings is my favourite book is that I find Tolkien’s creation of Middle Earth amazing. I love the detail and realism of the different races, languages, places, characters, histories and every thing else. Tolkien was so creative and imaginative and I like that. I will always love his wonderful world of Middle Earth. The Lord of the Rings is great and I have enjoyed it, am enjoying it, and will enjoy it for a long while more. Many authors borrow from Tolkien’s books and write new adventure stories, but there is something in the Lord of the Rings that will make me love it forever. They turn somebody into someone else. When rain falls it lands on you. They splash all over me. Don’t be scared because it’s only plastic. I wanted to be in a show because my older siblings have all been in shows. Being in a show seemed like fun because there were lots of people and lots of fun backstage. Also it looked like fun to be on stage and to have a whole audience in front of you. You have to be in grade two ballet to be in The Nutcracker, but I got to be in the show when I was in grade one because I wrote a letter to my teacher, Mrs. Bouman. My letter said, “Seeing as I can’t be in the Nutcracker, do you know of any other big show that I could be in?” Then Mrs. Bouman wrote me back a note. She said that she did need a small party guest and she asked if I could please tell her if I could be that girl. I was very happy. I only had three rehearsals because it was my first show. I also went to a costume try-on. I tried on three dresses and the last one was the best for me. My mum had to take up the waist because even that dress was too big. My dress was pink with little roses and bows. Before me, dancers Savannah, Brynn and my sister Hannah had worn that dress. My first rehearsal was in costume. It was fun. I got to learn lots of things and the other kids that I was dancing with were very nice and I loved to play with them. In the show, I was the youngest child in a family of four children. My stage father was called Gord and my stage mother was called Alison. They were very nice to me. After the rehearsals, the show took place at Humberside CI. I skipped and ran and watched the other dancers. At the end of the party scene, my stage father carried me off stage and I had to pretend that I was asleep. Before each show, one of the bigger girls did my make-up and hair. They put up my hair in braids across the back of my head. Then I waited in a line with my partners Sarah and Assantuah until all the audience was in their seats. We snuck up the stairs leading to the hall where the audience was sitting and then we waited until the main maid came running toward the front of the stage. Then we all ran down the aisle to the stage. After each show, I took off my costume and my granddad drove me home. After the last show, we all went to the dance school for the cast party. There were lots of things to eat and drink. I danced and played with the other kids. I had lots of fun in The Nutcracker and I am looking forward to being in it next year. In our household we have various annual traditions; one of them is putting on our own production of the Tchaikovsky ballet The Nutcracker. Every year at Christmas time this little 30 minute show takes place in the living room of our house. The cast is made up of four people, me and my three younger siblings Hamish, Clare and Nora. Our Mom is our stage manager and our Dad is our set designer and maker. Casting the production is always a fun challenge because of course people don’t want to be the same roles over and over again. Even if they were perfect in a certain part they don’t want to play it again. The exception to this is my brother who is always happy to perform the part of the Nutcracker. Every year casting is always done in early September and we always try to start rehearsals around that time too. One challenge for us is that our dance school starts casting and rehearsing for their Nutcracker at the same time–and we are also in that production. The ballet school’s Nutcracker takes priority from October to December and then we pick ours back up again in the middle of December. At that point in time we have to start rushing to get our show choreographed and polished. On top of that we also make programs, costumes, hair pieces, backdrops, shortened versions of the music, props and treats for the intermission. However, when it is finally ready to go it is definitely worth all the hard work that is put into it. But I must say that it would definitely not be the wonderful show that it is without the help of Mummy and Daddy. They do so much for us and our show every Christmas. Our first show is always given to our grandparents and our uncle on Boxing Day. Despite our intention of it being a show it always turns out more as a dress rehearsal. Then we fix it up and perform it to various other people such as our dance teachers our next door neighbours and our music teacher. Every year the Artistic Director of our dance school, Mrs. Bouman, comes to watch the show. Our audience can be at the maximum five people so we wind up doing a lot of shows. This is because the audience sits in our playroom where we store the living room furniture during the show. This makes the space quite small. One good thing about doing our own Nutcracker is the immediate feedback that we get from the audience afterwards. It’s always nice to get comments (both positive and negative). As we wrapped up our fourth annual production I decided that I wanted to make the fifth year perfect, but it already is such a charming production that I don’t think it needs anything more. Back to Basics: what is it I do again? There are those times in your career when you think about the path that got you where you are and wonder about the parallel universes where you’re doing something radically different. When I think back on how I wound up becoming a user experience/interaction designer / information architect, the path is similar to many people. I started with a knack for writing and a knack for computers. This led to a technical writing job explaining software to people in as plain a language as possible. As I did more and more of this, I found myself writing around the bad usability of the software I documented. I was user number one. Well, maybe QA and I were users number one together. Being user number one made me more and more interested in user centred design (UCD) principles, and I began to take an interest in how users accomplished their tasks in the software I worked on. Over time, I managed to convince one of my managers to allow me to move from the back end of the software design lifecycle to the front end. It didn’t work out so well at that particular company, but it did give me an opportunity to begin experimenting with rapid prototyping, and gave me a visceral sense of how crucial it is to know something about the people who will use your product or service. I have carried those things I learned with me through a number of successive roles as an Information Architect/Usability guy at a number of different web-based companies (and one disastrous experiment in the public service of Ontario). We believe that the human condition is increasingly challenged by poor experiences. IxDA intends to improve the human condition by advancing the discipline of Interaction Design. To do this, we foster a community of people that choose to come together to support this intention. IxDA relies on individual initiative, contribution, sharing and self-organization as the primary means for us to achieve our goals. There are ux/interaction designers out there that tackle real, compelling problems for users of services, products, and systems. I envy these folks every day. I think that startups like Ready for Zero capture the essence of what’s possible with a few dedicated people and a really great idea to solve a real problem. In November of 2010, Peter Merholz, of Adaptive Path, gave voice to something that I think gets to a lot of UX people who are in agency environments, unleashing a firestorm of criticism and support from all sides. Then, in February 2011, Kaleem Khan spoke on “Ethical Interaction Design” at the 2011 IxDA conference in Boulder, CO. At that same conference, Richard Buchanan pronounced that “Interaction Design – no, all Design – is about human dignity”. These and other conversations have been buzzing in my head for awhile now, and I presented my hope to the Toronto IXDA group in the hopes that we could start thinking about what it means, to paraphrase Buchanan, design for the interaction between people through the mediating influence of technology. As an aside, technology is such a broad term here. Did an interaction designer have any input on the ticket window at the bus station, where I speak to the agent through a plexiglass panel in which a microphone and speaker are mounted? I’m guessing not. There’s not a whole lot of dignity in that particular experience. It feels like a prison visiting room. It’s been six months since I attended Interaction 11, and I am no closer to pinpointing what it is that I do for human dignity in our over-technologized society, but I really feel, as a designer, that there’s more to it than gadgets and brands. Sometimes innovation can be achieved by getting back to basics. If it sounds lofty to consider human dignity a goal of design, I figure it’s a pretty good place to start. And so I say this: if you have a project or product that you think meets this goal in some way and you need someone who’s been doing UX for quite some time to help out with it, pro bono. Then we should talk. Posted in ramblings	| Tagged ux	| Comments Off on Back to Basics: what is it I do again? 1. Official death toll in Japan is 5000 with 8000 still missing. 3. People returning from March break vacations were having to endure long lineups in customs at Pearson International Airport in Toronto. Perspective. That’s all I have to say. This morning I was given the compliment by a complete stranger that I was a “good problem solver”. It was the kind of exchange that I enjoy because it makes me think about how much an individual’s experience affects how they approach a given problem. It goes like this: I was on my way to work and stopped in at the fantastic linuxcaffe, which lies conveniently between my house and the subway station. They make a mean cafe mocha and the staff and patrons are uber friendly. As I waited for the server to make my mocha, there was the sound of 3 medium-weight thumps directly above us. The server referred to them as the random 3 bumps that she often hears in the morning – once and only once, a series of 3 bumps as if someone was jumping. She couldn’t guess what it might be. “Do kids live upstairs?” I asked. “No,” not at the front of the building. I thought for a moment, and then just blurted the first thing that came to mind and it seemed to fit the situation. “Skinny pants!” the server said. “I bet that’s what it is! They look like skinny pants people.” That’s when she paid me the compliment. I thought about it on the walk up to the subway — about how much of my daily work as a User Experience (UX) designer is an attempt to extend the sum of my own past experiences into creating new ones for the users of the products and services I design. Sometimes solving the problem is easiest and most intuitive when your own life experience tells you how almost instinctively. The ‘problem’ here was obvious to anyone who has watched their kids try to get into dancing tights before a dance class – it’s usually a 3-jump effort before everything’s on just perfectly. Add to that the time (8:30am), the fact that it’s an apartment without kids, and I figured I had alighted on what was very possibly the answer. Of course, until I test my hypothesis, it’s quite possible that it was something completely different than what I guessed. That’s the way it is in UX practice, unfortunately. Often, because of time & budget constraints, you just have to go with our gut and hope that you’re right. It’s always nice when you get validation from at least one other person. It’s nicer still when someone accepts your guess with some enthusiasm.